It is disappointingly easy to fall back on existing prejudices when you're presented with a title like Love Nikki-Dress UP Queen. From the title and icon alone you would likely jump to the conclusion that this is a simple dress-up game designed for a casual audience, quickly writing it off as something silly and throwaway. But it isn't. Love Nikki, underneath its cute exterior, is an incredibly deep RPG with tonnes of content, a unique and interesting PvP aspect, and some of the most rewarding monetisation in mobile games. With that in mind, it's little wonder that it's starting to climb high in the top grossing ranks. Developed by Tencent and published by Elex, Love Nikki was launched initially on April 20th 2017 on Google Play, but it didn't exactly have the best start. It didn't enter the top 500 grossing charts in the US until May 1st, but since then has slowly climbed its way up. It finally cracked the top 100 in the UK on July 4th. And now, following the addition of a new chapter and a handful of events on August 9th, it's shooting even higher. It's a different tale on iOS, however – Love Nikki's top grossing position in the UK fluctuates wildly but has seen an upwards trend, finally cracking the top 100 on August 9th. It managed the same feat in the US, but has seen a steadier growth, lingering mainly around the top 300 ranks. That might not be megabucks, but it's getting there, thanks in part to a huge Facebook ad campaign and good old word of mouth. So how exactly does a game about fashion keep its players coming back and spending money? For starters, it offers up plenty more beyond simply wearing clothes. The core of the whole experience is, of course, dressing up. 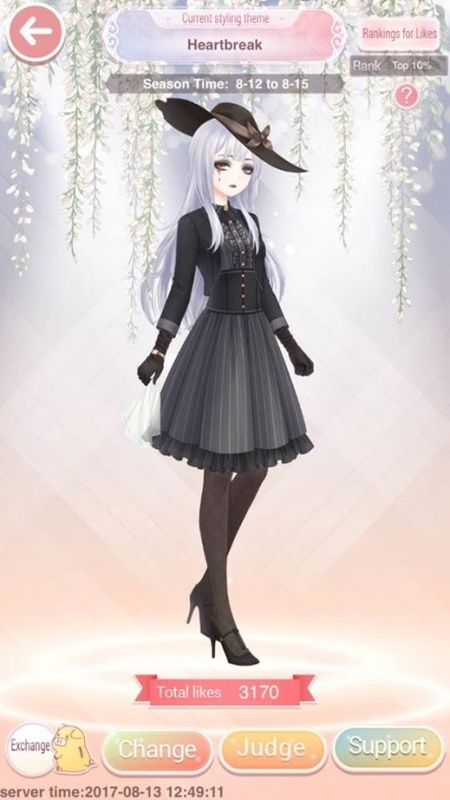 You're given a standard avatar and a wardrobe full of clothes, accessories, hairstyles and just about anything else you can think of, and you can apply them to your Nikki as you please. 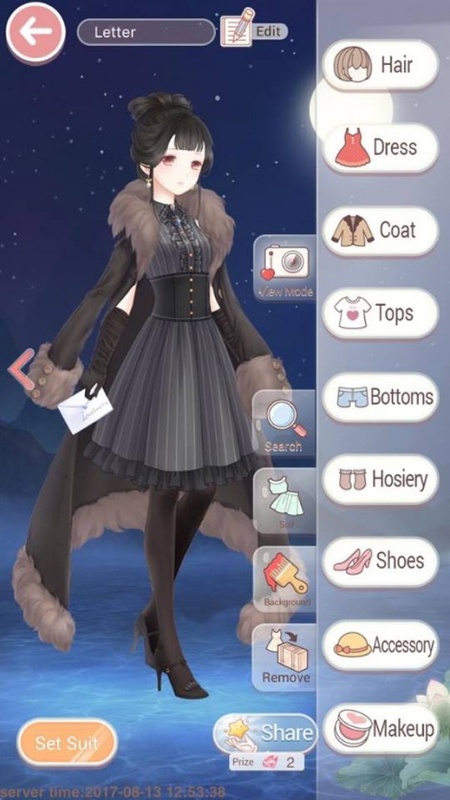 There is a Free Dress mode available if players just want to create nice outfits in their downtime, but to get to the meat of the game you need to head into the main campaign. Here players enter a series of competitions against characters they meet to create the best outfit to suit a specific theme. This is given to players in descriptive form, which they then need to translate into an outfit with the highest stats. The clothes themselves all have specific attributes, and higher-ranking clothes have better stats in these attributes. If you need to create a "cute" and "sporty" outfit, you'll need to equip clothes that are high in both these attributes to win. Levels also have a ranking system, so if you barely scrape through the competition you'll earn a worse ranking than if you obliterate your opponent's outfit. You can also only access the higher-level rewards, and the ability to autoplay completed levels, if you score an A or S rank in the mission. But the main story mode can only keep players interested for so long. What Love Nikki has to retain its fans is an extensive range of events and PvP content. There are two online arenas to take part in – the Stylist's Arena, which is a 1v1 PvP battle with one of 10 themes offered each time you play, and Competition, which gives every player the same theme for three days and asks them to vote for their favourite outfit designed by other players. Competition is the most interesting because the rest of the game is based on stats – here, it's all about the visual aesthetic and pleasing your fellow player. This is tied in with other events too, each of which come with their own new and exclusive outfits. Fail to unlock these events during events, and you'll probably do poorly in the Competition. As an example, a recent wedding event rewarded players with parts to a wedding outfit. These events appear as a five-part solo campaign, which unlock new items and outfit parts upon completion and can be repeated several times to grind out more parts to craft the bigger items. During the wedding event, publisher Elex ran themes in its Competition that focused on its wedding outfits, though not explicitly – the Competition theme was vague enough to allow for open interpretation, but for the vast majority of players, it meant "wedding". Unless you'd done the work and unlocked new wedding gowns and items, you were unlikely to get any votes from the other players for your outfit. Grinding out these events is no mean feat either, and will sometimes require that you spend real-world money to get ahead of the pack. But even the currency and IAPs in Love Nikki go deeper than most other games. There are two main currencies in Love Nikki – coins, the soft-currency earned through play, and diamonds, which can be earned through daily quests or bought in IAP packs. These come in the usual tiers ($1.99 up to $99.99), and act in the typical manner of offering rewards faster to players. 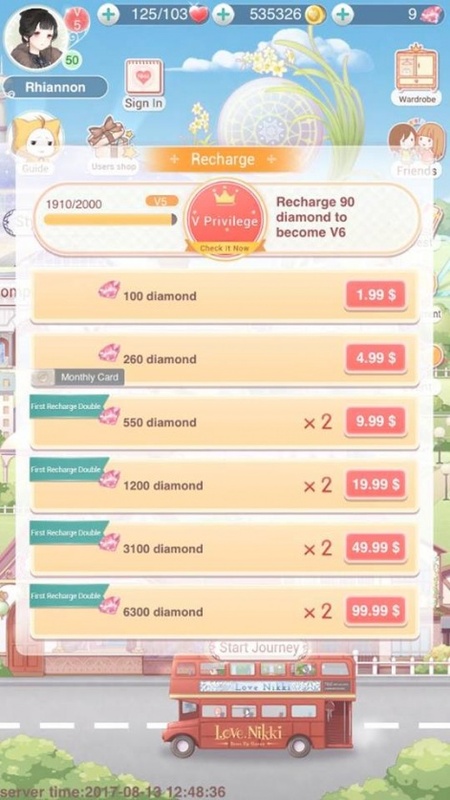 Diamonds can be used to buy outfits and parts in the game's Mystery House gacha, recharge stamina to keep playing the solo campaigns, refill Stylist's Arena attempts, and so on. Coins and diamonds aren't the only currencies in the game, however. Every single event, additional mode and even gacha box has its own separate currency. Competition mode has Glass Roses. Stylist's Arena has Starlight Coins. Buying a gacha roll earns you a currency specific to that gacha, which allows you to buy any parts you're not unlocking through chance. Each five-campaign event comes with its own currency for finishing off the collection. You can buy packs of these currencies with real-world cash, but mostly you're encouraged to play these modes repeatedly, and do well in them, to earn them. These currencies can also only be spent in their specific area, and you need them to earn certain items. Crafting recipes, for example, can only be bought in the Stylist's Arena with Starlight Coins. You aren't expected to buy new currency packs just for the sake of it though. The game offers plenty of rewards for your investment. Buy enough diamonds, for example, and you'll earn a VIP tier, which offers you exclusive clothes, discounts across the game's shops, bigger daily login rewards, and more. There's 15 tiers to the VIP scheme, each with bigger and better rewards to make the prospect more tantalising. All players need to do is keeping spending and they'll make their money back while they play. You also get bonus stamina each day just for logging in, which is doubled on the weekends to encourage longer playtimes, and there's a wealth of Daily Quests and achievements to shoot for which earn you even more free stuff. 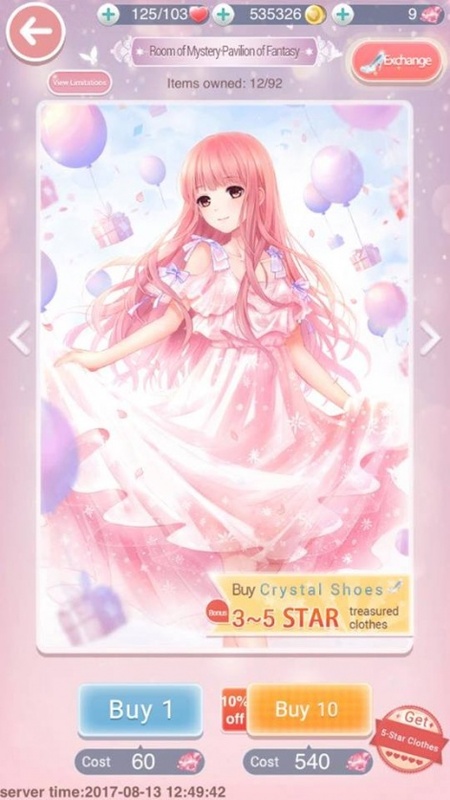 Glance at the name and icon and you'll assume Love Nikki is a standard dress-up game, but spend a little time with it and it becomes much more intriguing. It's a seriously impressive return on investment both in terms of time and money, and it’s one that actively encourages players to play and spend, beyond simply unlocking items faster. Love Nikki-Dress UP Queen is, overall, an impressive and fascinating game. A quick glance at the name and icon and you'll assume it's a fairly standard dress-up game, but spend even a little time with the game and it becomes much more intriguing. With plenty to see and do, and tons of things to unlock at all times through events and specific stores tied to PvP, it's clear to see why players are returning to the game each day. And it does plenty of interesting things with its monetisation, offering a huge return on investment when buying diamonds and driving retention by offering event-specific currencies that are lost after a certain time. But you also won't miss out too much if you do end up losing these currencies. They're just another helping hand for the power players willing to spend their time and money, and provide a small boost even if you're only playing casually. Love Nikki may have taken its time to break the top spots of the grossing charts, but now that it's reached the top 100, it's likely to stick around for the foreseeable future.